Wow – that’s the first word that slipped out of our mouth. Indeed, the Traxxas X-Maxx 4WD Brushless Electric RTR Racing Truck is a beast. 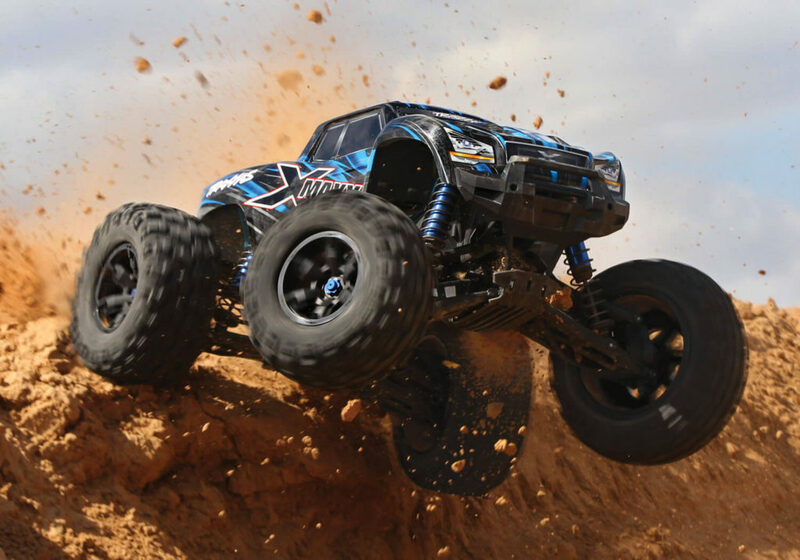 This racing truck from Traxxas is big and ferocious. Once you turn on the engine and speed away, there is no going back. You will be addicted to its roaring sound and powerful performance. 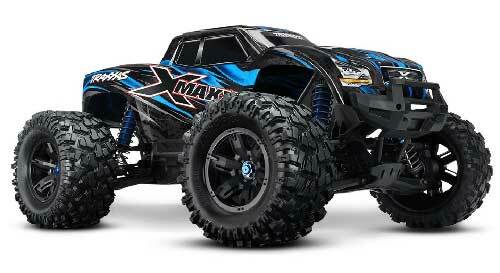 The X-Maxx truck is of a 4WD type that is fully equipped with a brushless motor. With this type of technology, you can expect higher power output and a more exhilarating driving experience. 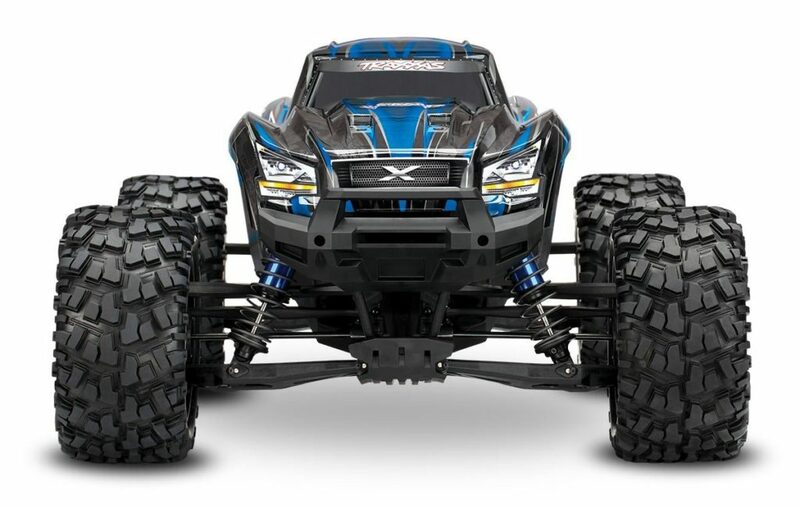 Traxxas X-Maxx is a 1/5 scale electric racing truck that comes together with the 2.4GHz remote control, which is the standard frequency these days. Insert a set of four AA batteries inside the transmitter and it will be ready to deliver precise controls to the truck. There is also a an app called Traxxas Link that allows you to add modules and connect to the smartphone’s app for further customization. From the mobile app, you can also view the real-time telemetry. Design wise, we found the truck to be very attractive. The body is molded in a stylish and ergonomic way. There are two color variations you can choose from – blue and red. The modular chassis provides easy access to some of the important components and makes maintenance quick and simple. One of the features that we loved is the patented self-righting technology. With it, the truck can get back on its four wheels in no time after being flipped over upside down. A simple push of a button, “Set” button to be exact, on the remote will do the job. We also loved how it comes with a clipless body mounting, also known as a latching system. It results in a quick and easy setup. Plus, the latch also secures the body firmly to the chassis especially during the jumpy drive and elongates the life of the compartment further. Size wise, this truck is definitely not a toy grade. It is enormous with a dimension of 29.8 x 21.3 x 13.8 inches. If that measurement is too hard for you to visualize, here is the easier one: 30 inches long and 21 inches wide. The tire itself can reach up to 8 inches high! 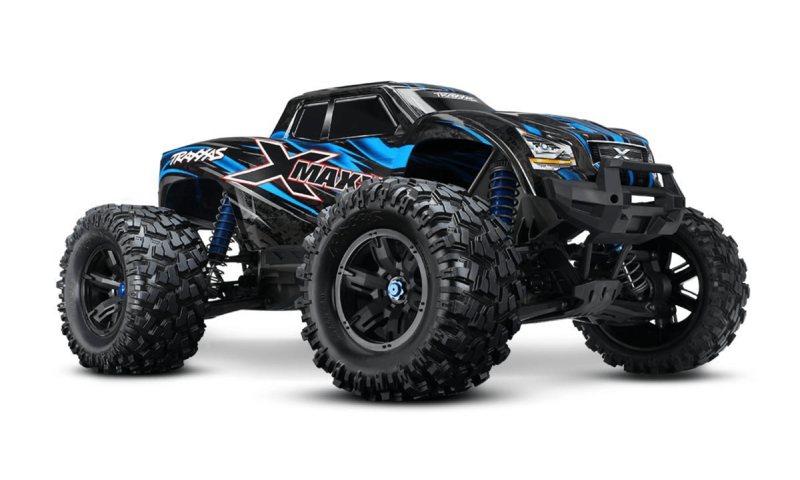 With this size, we bet the X-Maxx can conquer extreme terrain with absolute ease. Inside the chassis, the battery is secured firmly inside the snap-lock battery retainer. There is also the slipper clutch that does not only help to absorb shock loads but also provides extra force for it to go into full throttle smoothly and quickly. Firstly, the stability of Traxxas 4WD truck is amazing. The oil-filled GTX shock absorbers and TSM (Traxxas Stability Management) help the truck to remain stable by absorbing bumps efficiently. You can expect this RC vehicle to ride over slippery terrains without any issue. It can fly high, flip stylishly in the sky, and lands safely on the ground. 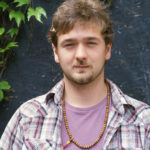 Many users have claimed that it does not spinouts out of control or lose control easily. Plus, the 18 pounds of weight provide further stability supports to the vehicle. As if that’s not enough, there are also impact cushions installed on both front and rear bumpers to soften up the impact further, resulting in a soft landing. Besides the stability, this RTR truck also has incredible speed. On general setup, it can go up to a maximum of 35mph. The Velineon 1600XL Big Block brushless motor is nicely supported by the powerful 6S 22V dual-LiPo battery – the battery does not come together with the purchase. You will have to buy it together with the charger separately. So, do not let the giant size fools you. It is not sluggish at all. In fact, it can surprise you with its super fast speed. You can even do wheelies, spinning, and flipping if you want to! When it comes to the battery, it is highly recommended for you to purchase the one with at least 5000mAh of capacity. It is to support the powerful motor and provides a longer driving duration. In general, with such 5000mAh battery, you can expect to run the truck between 15 to 20 minutes. This particular racing truck model can support up to 84000mAh batteries. Besides the capacity, the battery runtime also depends on the riding surface, gearing, and throttle controls. Now, having a speed without control is useless. Therefore, the manufacturer has equipped its RC truck with top-performing and brand-new Steering Servo. It provides powerful torque and results in a quick steering and sharp turning circle. Many users have complimented the excellent control possessed by this truck. What’s not to love about this truck? Since it is an RTR model, there is not much assembly needed. Plus, the maintenance is also a breeze. The electronic compartments are waterproof. They repel water and moisture brilliantly. Hence, a spray of water after a dirty drive in the mud should cause no circuit shot or breakdown. One of the biggest advantages of this truck is its supreme performance and extreme durability. It is a high-grade racing truck that can satisfy the needs of intermediate and advanced users. This RC truck is no softy – it can survive just about any environment. You can drive it on water, snow, mud, beach or paved roads and you will not be disappointed. Not only it is waterproof, but it is also rugged and durable. The manufacturer has put a well thought in the design. It is built to last and super easy to service and clean. Plus, the truck also provides extra customization. The gears can be changed around. You can switch it to 11-tooth pinion gear for more power and even upgrade it to 25-tooth pinion gear to increase the speed to 51mph! There are also several shock upgrades and various spring options that you can try. While the price can be quite high, we truly believe that there is not much to debate. The quality of the material, the superior performance, and high durability speak for its high price. Regarding the performance, there is not much to critic. However, some users have commented that they wish they could tweak the suspension further – as of now, there’s not much room for that. Also, another thing that you should keep in mind when buying this RC truck is that there is no battery included in the purchase. The manufacturer wanted to keep the price reasonable and at the same time, allows you to pick the right battery for yourself. The battery comes in various capacities, and you can choose based on your needs and budgets. Superb is the right word to describe this Traxxas X-Maxx 4WD RTR Racing Truck. It is built to run like a monster. It can survive just about any types of terrains and do so brilliantly. The outstanding stability, precise steering control, high durability, and fast speed are unbeatable. With such epic performance, the 5-star rating on Amazon.com comes as no surprise. As a conclusion, we highly recommend this model to all advanced users and even newbies who own adventurous spirit. It might be expensive, but we promise it is all worth it.